According to the schedule of the UN Security Council, an open ministerial meeting of the Security Council on the Korean Peninsula nuclear issue will be held on 28 April. Minister of Foreign Affairs of China Wang Yi will attend the meeting at invitation. Q: It is reported that on 26 April, the White House arranged relevant officials to brief all senators on the DPRK issue. The joint statement issued by the relevant officials after the briefing said the US will pressure the DPRK by economic sanctions and diplomatic measures and that the US remains open to negotiations. What is China's comment? A: We've noted the remarks from the US side. In fact, apart from the Senate briefing yesterday, US senior officials have made many remarks recently about resolving the Korean nuclear issue through dialogue and consultation. We've noted the remarks and the message of expecting a peaceful settlement of the issue through dialogue and consultation conveyed in them. We think the message is positive and should be welcomed. We hope and believe all relevant parties of the issue have noted the US remarks and the message in them. What I want to say is that dialogue and consultation is the only right path towards the solution of the Korean nuclear issue, and peaceful settlement best serves the interests of all parties involved. The situation on the peninsula is complicated and delicate. All relevant parties should stay calm and restrained, refrain from any action that may aggravate the tensions and make joint efforts to ease the situation. Besides, the US is one of the main parties on the Korean nuclear issue. We expect and welcome the efforts of the US to play its due role and shoulder its due responsibility in settling the issue. China's position is clear-cut. We are willing to work and make every effort with all parties concerned including the US to push forward peaceful settlement of the Korean nuclear issue through dialogue and consultation. Q: One most serious foreign policy challenge President Trump faces is the issue of the DPRK. And for this, he has expressed his hopes of working with China to strictly enforce the UN sanctions and use China's trade and financial leverage to pressure the DPRK to give up its nuclear and missile program. As President Trump marks his 100 days in office, what can you say about how China is cooperating with President Trump in terms of enforcing the sanctions concerned? What specific measures is China taking in terms of curtailing the trade in coal, fuel or iron ores? And are these measures being strictly enforced at the border points between China and the DPRK? And in general, how would you assess President Trump's 100 days in terms of the development of bilateral relations? 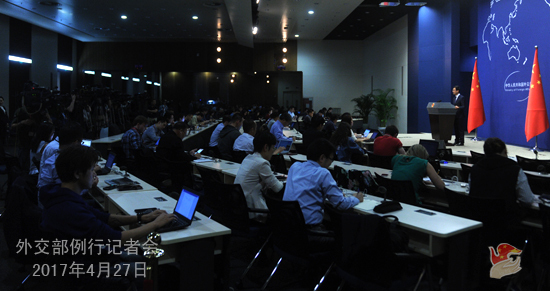 A: Your question is mainly about China's implementation of the UN Security Council resolutions concerning the DPRK. China's position is very clear. As we have said many times, China has consistently, fully, accurately and earnestly implemented the DPRK-related resolutions adopted by the Security Council. After the relevant resolutions were adopted, Chinese competent authorities have released announcements and statements in a timely manner to make concrete arrangements for the implementation. 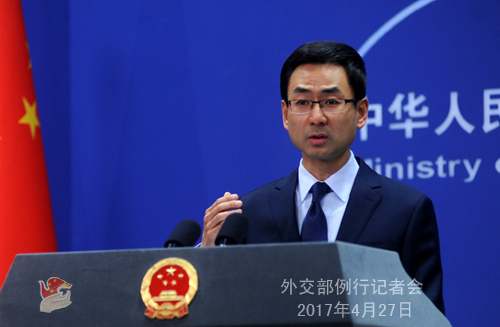 China has formed a set of effective mechanisms and practices to implement the DPRK-related Security Council resolutions, and its efforts in this regard have been widely applauded by the international community. As a permanent member of the Security Council, China is fulfilling its due international responsibility in implementing the resolutions concerning the DPRK adopted by the Security Council instead of doing so under any external pressure. You also asked about how we assess the China-US relationship after 100 days since President Trump came into office. It is widely known that since President Trump took office, President Xi Jinping has maintained close communication with him through meetings, letters and telephone conversations. At the beginning of this month, they met at Mar-a-Lago, during which they had an in-depth exchange of views on bilateral relations and major international and regional issues, and reached many important agreements. The meeting was highly successful and effective. The two sides should earnestly follow through the important agreements reached between the two presidents. The Chinese side is ready to work with the US to push forward sustained, steady and sound development of the bilateral relationship on the basis of mutual respect and win-win cooperation. Q: It is reported that on 26 April, the EU released the 2016 Annual Report on the Hong Kong Special Administrative Region and the 2016 Annual Report on the Macao Special Administrative Region, in which it made comments on Hong Kong and Macao affairs. What is China's response? A: Since the return of Hong Kong and Macao, the practice of "one country, two systems" has achieved enormous success. It is widely recognized that the system of special administrative regions stipulated by the Constitution and the Basic Laws has run effectively, and Hong Kong and Macao have maintained prosperity and stability. The determination of the Chinese government to adhere to "one country, two systems", "Hong Kong people administering Hong Kong", "Macao people administering Macao" and a high degree of autonomy is unwavering and will not change. We always firmly object to the regular release of the so-called annual reports by the EU after the return of Hong Kong and Macao. We require the EU to stop the wrong practice and its interference in Hong Kong and Macao affairs, and do more to develop China-EU relations instead. Q: There are reports that Israel may have conducted an airstrike on an airport near Damascus. What is your comment? A: I've noted the relevant reports. China's position is very clear: we always oppose willful threat or use of forces in international relations. At the same time, we hold that sovereignty and territorial integrity of all countries should be fully respected and upheld. 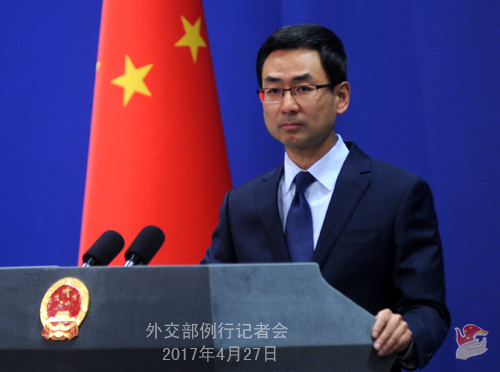 China believes that political settlement is the only realistic solution to the Syrian issue. The future of Syria should be determined by Syrian people. All sides should make joint efforts to continue facilitating political settlement of the Syrian issue. Q: Venezuela said it would withdraw from the Organization of American States (OAS). Do you have a comment? Do you think this decision will escalate the tension in Venezuela or complicate the relationships between Venezuela and the rest of the countries from the region? A: Regarding the statement of the Venezuelan government to withdraw from the OAS, it is the internal affair of the organization itself and we will not comment on it. We have already explained our position on the domestic situation in Venezuela. China maintains that peace and security is a blessing for a country and its people, and the key to the problems is in the hands of the Venezuelan people. China sincerely hopes and believes Venezuelan people can handle their internal affairs properly, and maintain national stability as well as economic and social progress. Q: China launches its second aircraft carrier yesterday. Does the Foreign Ministry feel that the development of China's aircraft carrier program is an important step for China in being able to secure its foreign policy, particularly as we have the Belt and Road Initiative which is going to see increased Chinese investment and citizens abroad? A: I already answered the question yesterday. The Ministry of Defense will hold a press conference this afternoon, which I believe is a more suitable venue for your question about the aircraft carrier. But now that you've brought up the question, I'd like to advise you to pay attention to the remarks of Foreign Minister Wang Yi during the joint press conference with Vice-Chancellor and Foreign Minister of Germany in Berlin yesterday. Foreign Minister Wang Yi said that China's overseas interests and people-to-people exchanges have been spread around the globe. The number of Chinese-funded enterprises registered overseas has reached near 30,000, and several million Chinese citizens are working and living abroad. Most of the cargo ships in all major international waterways are loaded with Chinese goods or related to China. Under such new circumstances, China has sufficient reasons to enhance its defense capability and contribute to international and regional peace. Besides, as I said yesterday, China pursues a defense policy that is defensive in nature and commits itself to the path of peaceful development.